Hua Hin is a Thai seaside resort which marries cosmopolitanism with the gentle ambience of sea upon sand. It was built in the 1920s to provide respite for the aristocracy from the muggy heat of the Thai cities. 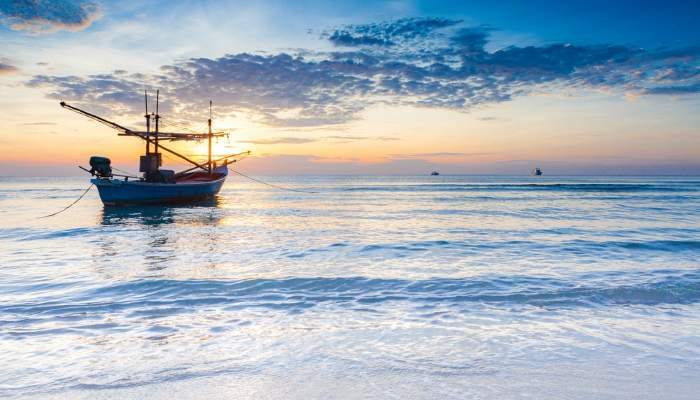 It’s fairly easy to get to from Bangkok, so if the sun’s a bit too stifling for you in the city, then make a quick excursion here for cooler temperatures, pretty beaches, and low-priced seafood. Just before turning into Khao Takiab you’ll find this weekends only market. It’s strewn with lights that illuminate the trees and make the market feel like some kind of enchanted fairground. 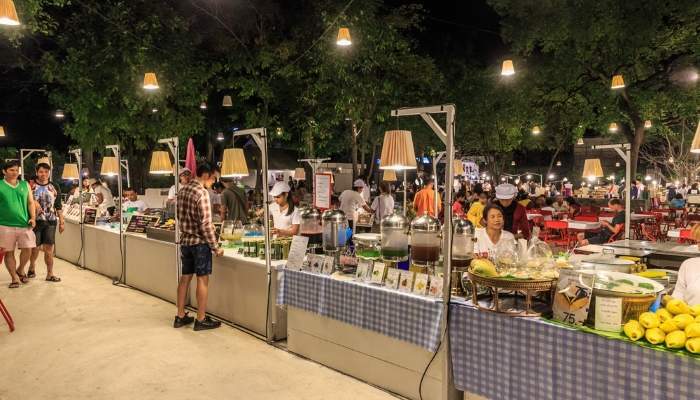 With live music tinkling away and a stew of delicious smells filling the air, you can find a whole host of stalls to explore before chowing down on some wonderful Thai cuisine. The market champions the local arts scene by showcasing pieces of artwork in the two large white buildings at the centre of the market, known as the Cicada Art Factory. Original pieces can be bought here whilst dancers and musicians perform on the amphitheatre on the opposite pathway. The market has a wide range of Thai and international cuisine, and you’re bound to get whatever you’re hankering for – whether that be chicken satay or (for the more adventurous) fried cockroaches. Started by three Hua Hin men, this sanctuary can be found in a verdant forest just on the city’s outskirts. 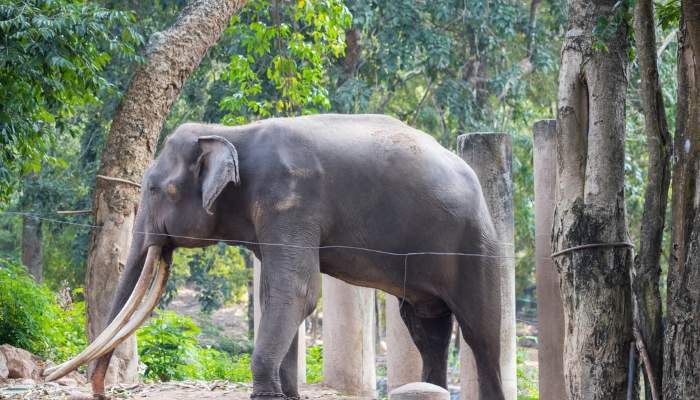 Unlike many so called sanctuaries, this foundation is more for its elephants than it is for humans, and here, the animals are well-loved and cared for, after having experienced some pretty sad beginnings. Many of the elephants at the foundation have been abandoned by former owners who used them for labour, but now they’re free to galumph through the trees, eat some good ol’ grass, and do whatever it is that elephants do. For a small donation you can feed, wash, and walk with them. 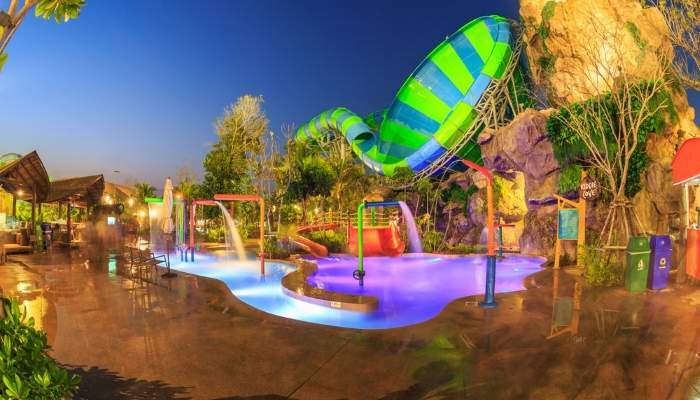 Vana Nava claims to be Thailand’s first eco-friendly water park jungle, and as labyrinthine slides mingle with the tropical jungle that surrounds it, you’ll feel like a soggy Tarzan as you swing through the jungle and plunge into its pools. You’ll hear the gentle tweedling of more than 200,000 living species amongst the trees, as nature and state-of-the-art technology converge. The park has Thailand’s largest water slide as well as Asia’s tallest man-made waterfall. Overall, Vana Nava boasts a collection of 19 slides from the industry leading WhiteWater – but it’s not just for thrill seekers. The flora and fauna on display here showcase the lushness of Hua Hin’s natural beauty too. 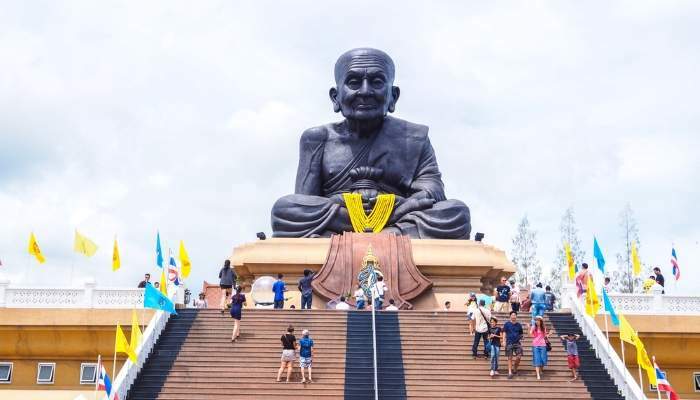 Amidst lakes, waterfalls, bridges and streams, and around 15 kilometres outside of Hua Hin sits the cross-legged statue of Luang Pu Thuad – a revered Buddhist monk from the 16th century. At 12 metres tall and ten metres wide, his head can be seen jutting out behind the tall trees. The statue is thought to bring good luck to those who kneel before it, and many Buddhists coming here to pray. It’s usually a peaceful spot because of this, but it can get overcrowded with tourists on weekends – so for a more authentic experience it’s better to come here on weekdays. There are also several restaurants within the complex, so you can enjoy Thai cuisine whilst sauntering through the serene grounds. City skylines and smooth, sloping sands converge on Hua Hin Beach. Just a few hours from Bangkok, this sugary stretch of sand is warmed by the Thai Gulf throughout the year. It’s a favourite with tourists for its constellations of shops, bars and restaurants as well as beach front hotels and resorts. The loamy sands of Hua Hills Vineyard produce award-winning wines. Set among banana trees, and with sweeping green hills in the background, the vineyard also provides al fresco dining, where wine is paired alongside some delicious dishes. For something extra special, take a tour of the vineyard on the back of an elephant. 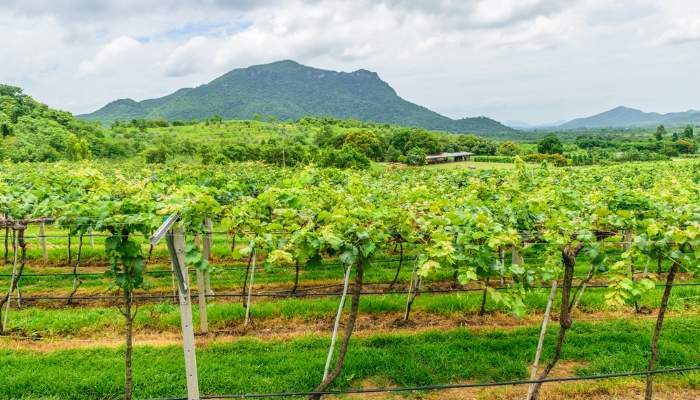 Hua Hin Hills is the only vineyard in the world to offer this experience, and it’s highly recommended. 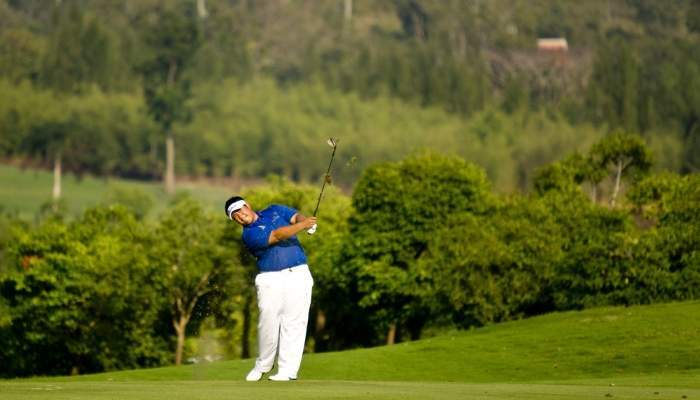 Having been in Asian Golf Monthly’s list of top three golf courses in Asia for three years running, Banyan Golf Club boasts an elite golfing experience. The Burmese mountains kneel in green and grey as you tee off, and they’ll follow you around this gorgeously verdant course. Banyan Golf Club is less than ten years old so it’s still relatively fresh, and there remains a faint mingling of pineapple in the air – since the course is built on a former pineapple plantation. The 15th hole is the capstone of the course as it looks out onto all-embracing ocean views. Hua Hin is a hotspot for rejuvenation rituals as the idea of ‘wellness’ is a particularly pronounced component of Thai culture. Marrying ancient techniques with some contemporary reworkings, the intention of these spas is to converge mind, body and spirit. 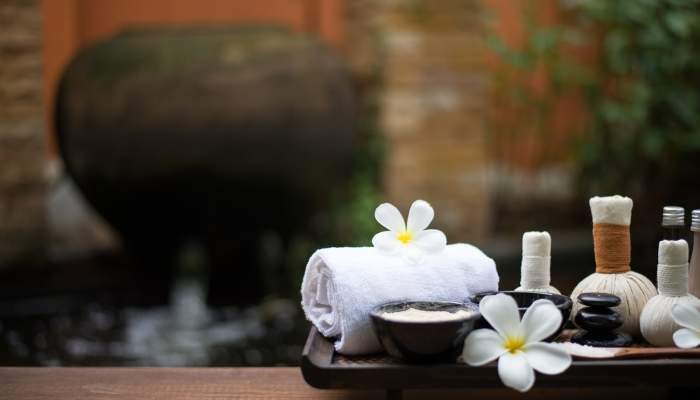 Spa Patcharapat does just this, and specialises in holistic practices to help tap into and reinvigorate all of the senses. It’s conveniently located near to a few of the destinations listed – it’s just a five-minute walk from Cicada market and Hua Hin beach. There’s no denying it – we live in a world in which much of our validation comes from the amount of likes we get on an Instagram post. Embrace it! 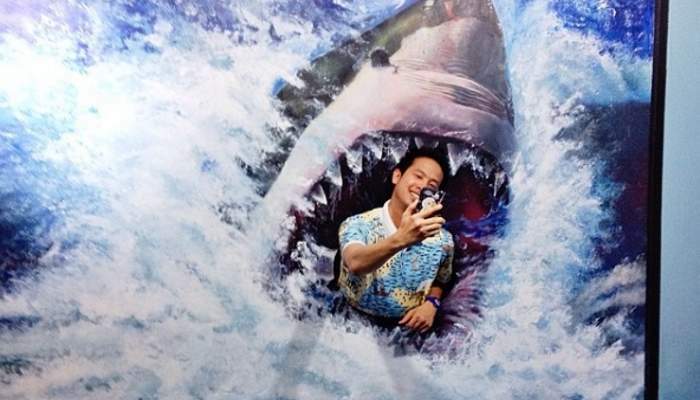 The selfie game at For Art’s Sake is strong and will give you that much-needed recognition. Pose in front of four-dimensional artwork that was made to have you as the focal point and fill up your friends feeds. There are several different themed zones – including horror and Hollywood – so that you can pose with monsters and put on your best duck face in front of a painted Cadillac. Nestled within the crevices of Chopsticks Hill live several troops of monkeys. They amble around from the base of hill all the way to the hill’s tip where a large golden Buddha is perched. 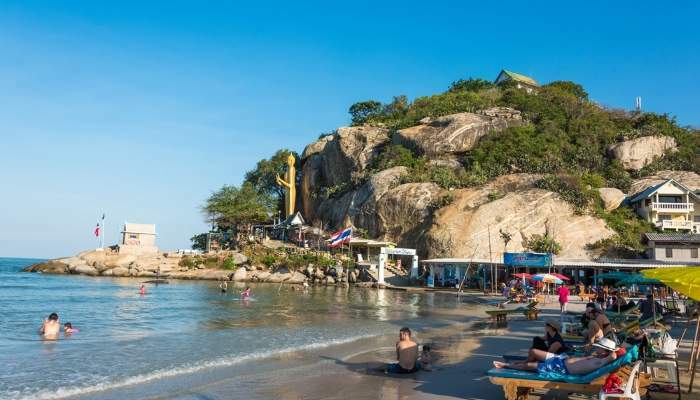 Scramble and palm your way along the hill’s rocky ascent for intoxicating views of the Hua Hin coastline. Then tumble down and cool off in the sea and have a couple bottles of Tsingtao on the beach.